Air Canada is having a Halloween Seat Sale. 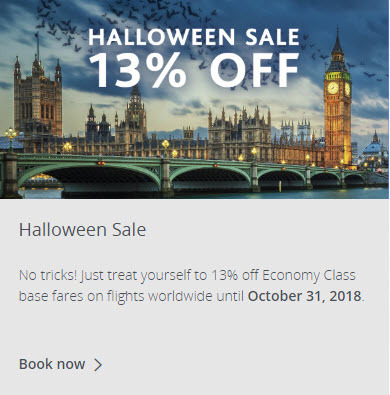 Today only, save 13% off Economy Class (Basic, Standard, Flex and Comfort) base fares on flights worldwide when you enter Promotion Code HALLOWEEN2018. Book by October 31, 2018, or be forever haunted by missing out. Book by October 31, 2018 at 11:59 pm from your city of departure in Canada. Valid on Economy Class (Basic, Standard, Flex and Comfort) base fares. Travel valid from November 13, 2018 until February 13, 2019. Valid on certain codeshare flights only (Lufthansa Group, Swiss International Airlines Group, Austrian Airlines Group, Brussels Airlines and Eurowings).